(Kampala, Uganda) Korea Institute for Development Strategy(KDS), in consortium with World Canaan Farmers’ Movement(WCM), planned and supervised the “Training program in Uganda National Farmers’ Leadership Center(NFLC) for Capacity development of Lecturers of National Agricultural Extension Center(NAEC) in DRC” from 22nd October to 5th November 2018, which is a part of Project entitled “Strengthening the Agricultural Extension System with a new training center in DR Congo”, funded by the Korea International Cooperation Agency (KOICA). As candidates for lecturers of NAEC, 21 congolese public officials were selected in 5 sectors; food crops, horticulture, livestock, agricultural extension and marketing. 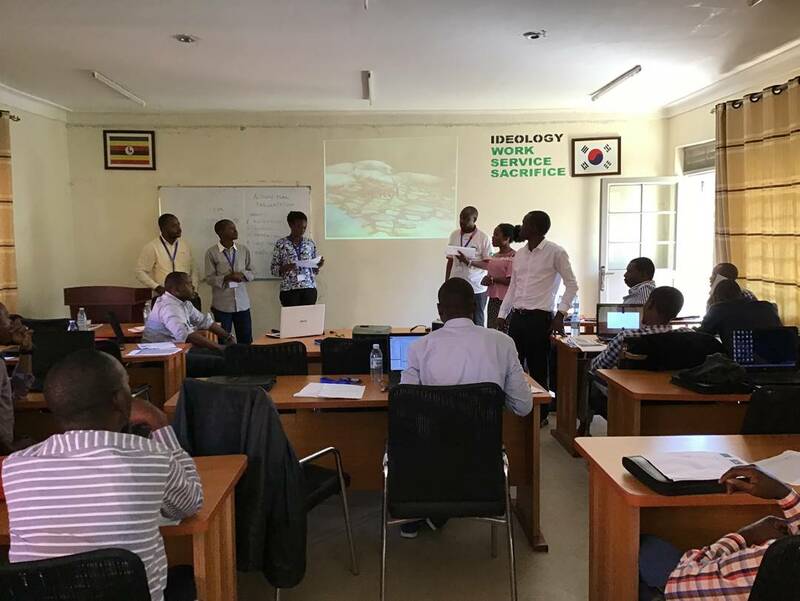 All 21 candidates were invited to Uganda NFLC in Kampala and attended various lectures such as mind-set, leadership, agricultural techniques and value chain development for two weeks. The Training program was finalized by the presentations of the Action Plans for future NAEC operation and training, which were developed by 21 candidates based on what they had learned during the program. This training program was designed to train potential lecturers of NAEC in a systematic way through step-by-step capacity enhancement, leading to an invitation training in Korea next year. Above all, it has great significance in that it was conducted in the form of south-south triangular cooperation in Africa, using the National Farmers’ Leadership Training Center (NFLC) opened in Uganda with KOICA’s support in 2016. All candidates for lecturers of NAEC who have been trained in Uganda will be participating in the invitation training program in Korea early next year, to prepare Grand opening of NAEC in August 2019. 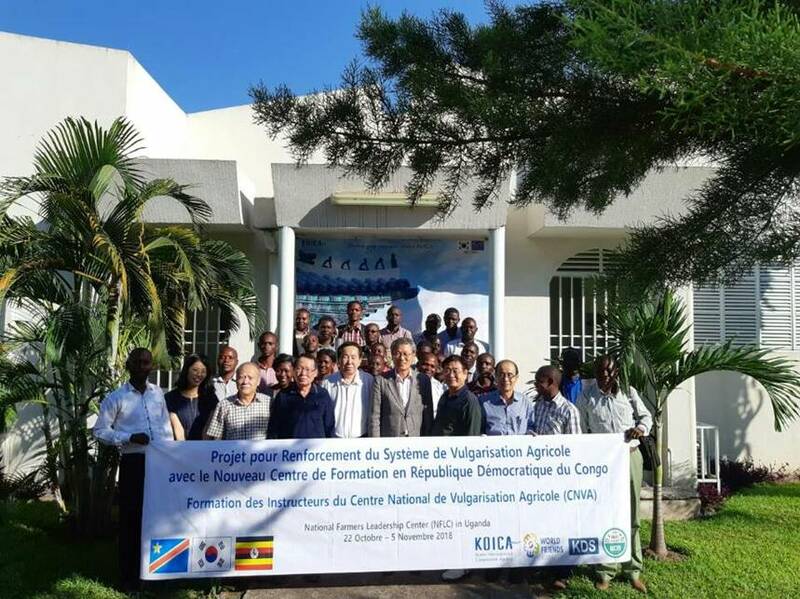 ** KDS, in consortium with World Canaan Farmers’ Movement (WCM) implements this project for 54 months from 2017, under cooperation with Ministry of Agriculture (MINAGRI) in DRC in order to increase the agricultural productivity of Congolese farmers through an improvement of agricultural extension system in DRC. The project is composed of 1) Construction and rehabilitation of National Agricultural Extension Center (NAEC) for Training of Trainers (ToT) and Training of Leaders (ToL), 2) Development of curriculum and textbooks, 3) Consulting on improved national agricultural extension system and consulting on legislation of NAEC, 4) Establishment of the center operation plan and its capacity building, and 5) ToT, ToL and technology dissemination projects.